I’ve had the pleasure of being a guest twice this week – first on a virtual trip across to Alison Morton’s blog, where I was sharing a few mental meanderings about historical truth and donkey poo. Alison is the author of the Roma Nova series, set in a world where the Roman Empire hasn’t fallen – so ‘historical truth’ is an interesting issue. 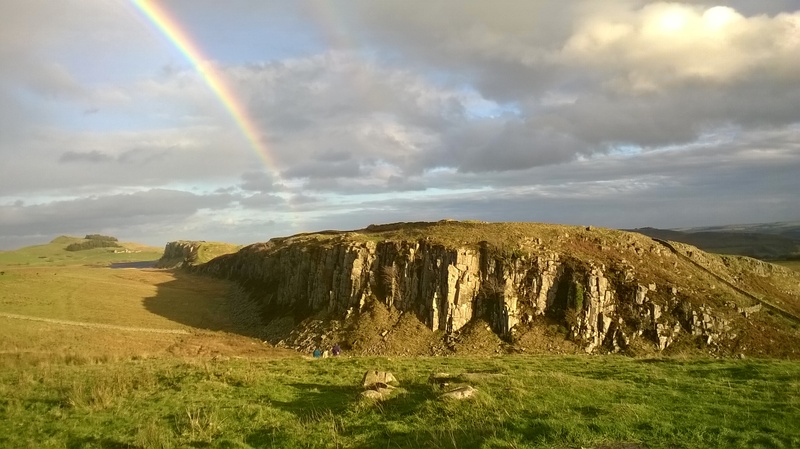 Then, while practially every other writer of historical fiction in the entire universe was at Harrogate (again, Alison’s blog will give you the low-down) I had the privilege of joining a group of visitors from the US on a visit to Hadrian’s Wall. Just as we were turning to leave Sewingshields (near Vindolanda) the sun came out, the rain began, and magic happened. Since I will never be able to travel from Texas to Hadrian’s Wall, this picture will do for the present. Thanx a bunch for the “memory”. Love all your writing……..luv, luv, luv Russo and Tilla……. Pleased to provide the virtual visit, Barbara! oh my gosh – so beautiful!!! one day i WILL get there!!! thanks for sharing this as well the roma nova series – sounds intriguing!